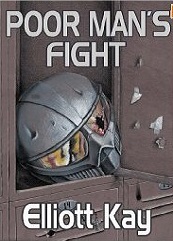 In "Poor Man's Fight," the author gives the reader an enjoyable read that transcends, in many ways, most scifi milfic. Although a bit slow to build, it turns into an action-packed thrill ride with fighting galore. In some ways, the protagonist, Tanner Malone, a boot crewman on a Archangel Navy corvette, is a typical action figure, fighting off huge numbers of bad guys and performing feats of derring-do. On the other hand, he is not always very likable, both by other characters and the readers of the book. He has issues, serious ones. What that does is make him more real despite his superhuman heroics. All of this renders Malone as one of my favorite protagonists of books I have read in the last couple of years. This is in most ways an excellent book, one that proves that indies can be better than most traditionally published books out there. On the surface, I would put this book up with the very top books in the genre. But as good as the book is, there are flaws that a good content editor would have caught. There were several mistakes made in timing as well as basic physics. One character was sent to Annapolis to go to the Naval Academy, then later was at West Point. Characters switched from being sailors to Marines. Although there are some sources that indicate otherwise ("The Chicago Manual of Style" being one of the dissenters), normally, "Marines" is capitalized as are all service members when the service name is used for the individual as well (as a former member of the Coast Guard, I am sure the author has seen "Coast Guardsman" capitalized.) This last one may not technically be an error, but as the book is written from the POV of people in the service, I feel it should be written in the style not only of military regulations but that most commonly used in the genre. While a basic content editor may not have caught it, a beta reader who had served in the Marines or Navy would have caught some mistakes in terminology, such as people calling a Marine gunnery sergeant "Sergeant." The shortened version of the rank is "Gunny" as in "Gunny So-and-so" or "the gunny." The issues above are merely bumps in the road to what is really a very, very good book. On the pure storyline and overall writing, it is certainly at the top of the genre. The book kept me up until 4:00 AM as I couldn't put it down, so that is a testament on what I thought of it. Because of that, I hate to write anything critical about the book; however, I do think the above should be noted. I read that a sequel is in the making, and I will buy it. I just hope the author is able to find a good content editor to help alleviate the small inconsistencies that arise in almost any writing effort. For more reviews or to buy Poor Man's Fight from Amazon.com, click here.